Dogs somehow love playing fetch, and I suspect that this Autofetch motion pet ball is more for the owner than the pet – after all, most pooches would be more than happy to play with their favorite ball throughout their lifetime, and won’t need improvements on a simple ball. What happens when your four-legged friend is more choosy? 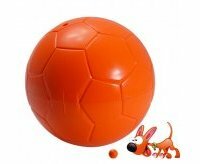 Guess the Autofetch motion pet ball might prove to be the catalyst required, as it requires you to put a small piece of food into the treat slot, giving the ball a slight shake to get the internal auto-motion gyroscope started. This allows the ball to start moving around randomly, and will come to a complete stop only after it does not receive any interaction for a minute. Perfect for restless dogs, but not so good when it comes to enforcing discipline.